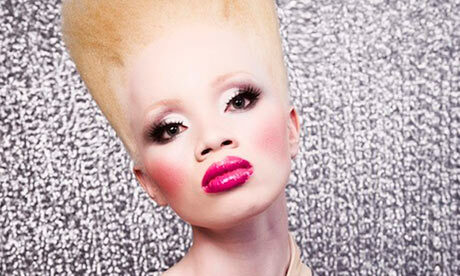 As a child with albinism, Thando Hopa was called names by her peers and regarded with superstition by the elderly. "Some saw me as good luck," she says, "and some saw me as bad luck." Recently all eyes were on Hopa again. This time she was striding confidently down the catwalk and earning newspaper accolades as South Africa's "the new face of fashion" and "fashion's new colour". The 23 year old is among a growing number of models with albinism challenging prejudice on a continent where the inherited condition � lack of pigment that affects the eyes, hair and skin � can lead to discrimination and even death. Hopa grew up south of Johannesburg with constant reminders to wear hats and sunscreen to protect her sensitive skin. She credits a strong and protective family for keeping her self-esteem intact. A full-time legal prosecutor, she had no thoughts of modelling until a chance meeting with fashion designer Gert-Johan Coetzee at a shopping mall. "After two minutes he said, 'Hi miss, are you interested in modelling?' I was open to it. SA fashion week was an overwhelming experience, a different world altogether with so much creativity." One in 4,000 people in South Africa has albinism. They suffer prejudicefrom employers and lack of recognition by government, say activists. Last year the kidnapping of a 14-year-old boy with albinism was blamed on traditional beliefs. There are hopes that positive portrayals of albinism can make a difference. "I really hope so," Hopa said. "I received some very positive feedback from young girls with albinism. If you don't see positive examples, you wallow in self-pity. I just hope it turns into another shade of normal." Coetzee said he was bowled over when he first ran into Hopa. "It was amazing, like somebody was shining a light at the side of my head," he said. "She was beautiful, with the perfect body and the perfect bone structure. She was glowing like an angel. "I've always wanted to do a show with someone with albinism and never found the right girl. When I saw her everything I was working on came together. Her skin is as white as milk, stripped of colour. There are endless possibilities." Coetzee added: "She was excited that she can be role model for girls with albinism. It's something to embrace rather than something to hide." Hopa follows Refilwe Modiselle, a model with albinism from Soweto who has been modelling since age 13 and now the face of South African fashion chain Legit. "I'm a black girl who lives in the skin of a white person and that alone should embody what a human being as a whole should represent," she told the BBC recently. But in east Africa particularly, people with albinism are believed by some to have mystical and healing power, putting them at risk of abduction and mutilation. Body parts are used in witchcraft or buried under businesses to bring wealth. Under the Same Sun, an advocacy and education group, estimated that 71 people with albinism were killed in Tanzania between 2006 and 2012, while 31 survived machete attacks. In June this year the body of a man was discovered with several of his body parts missing. Richard Mgamba, a Tanzanian journalist who has investigated the trade in body parts, said the example of Hopa shows "there are two different worlds for people with albinism: one where they are being hunted and killed, the other where they are being given opportunities to live like everyone else". He added: "In my country they are not given these opportunities. They are feared and treated as second class citizens. In South Africa we see a different story � a model with albinism � and for me that's very encouraging."